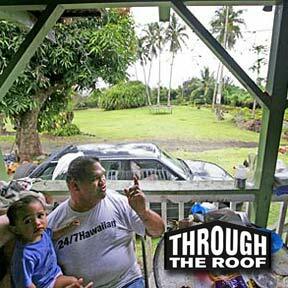 Through the Roof: Kaleo Kaina relaxes on the lanai of his home in Haou, Maui, with his 1-year-old granddaughter, Mahi'e. The home is about five miles from Hana. The area behind him once belonged to the family but has now been taken over by developers. Relatives of the family still live all around the Kainas' home.